My browband experiment has concluded. After searching for unique browbands online I had decided I really need to make my own. I wanted to do an orange browband, a millefiori browband, and a white/pink browband for horse shows. I got my empty browbands from delfinasaddlery.com and Ebay, using instructions that Delfina provides gratis. Delfina's browbands are quite nice, in a variety of colors and sizes. I got full size black in the curved style, and some 8mm beads and 3mm spacers from Etsy.com. I did the browband in one sitting on Saturday night. I made some mistakes, both in the selection of spacers and in the construction of the browband. But, I like it for all of its flaws! I LOVE the beads!!!! And I like the spacers. 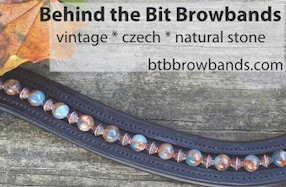 If you think that there is something magical about the empty channel browbands that makes it easier to work with hard leather, think again. I bent three leather needles and impaled my fingers twice. I was not 100% happy with the instructions from Delfina, but I'm not especially crafty. An experienced craftsperson would probably do fine. I will make more, but need to give my hands a rest! The spacers have very big holes, and they were not terribly stable in the strand. The instructions said to use an extra bead to accommodate the curvature. This caused the beads to "jam" in places. Jamming continued. Plus I tried to follow the "finishing" instructions and did not succeed. Notice the beadwork angles up at the end? It's partly the jammed beads, but also improper finishing. You can't see the jamming at all unless you are right up on it! I think it looks really neat! Whoops, I mean Dark JEWEL Designs. Sorry! I agree with Susan on everything! In addition, I think Riley will ROCK the orange and black. Impressive for a first time job. The imperfections are hardly noticeable and I never would have noticed if you hadn't pointed things out. It's going to look super on Riley. Ooooo! love the orange beads!